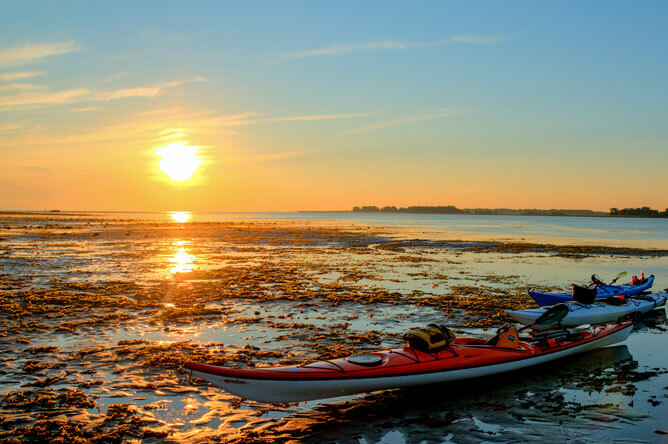 Excursions Kayakalo, based in Sorel-Tracy, offers guided sea kayak tours of the Sorel islands, Mauricie park, the Boucherville islands and the Rivière des Mille-îles. The tours are flexible and can be adapted to a variety of interests. 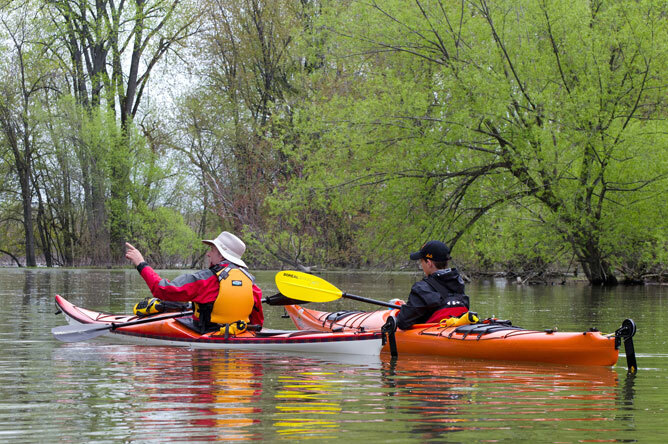 Basic kayak techniques are taught, and all equipment is provided. An Excursions Kayakalo guided tour explores a channel in the Lake Saint-Pierre archipelago. Lake Saint-Pierre and its archipelago are a spectacular sight, especially at sunrise. Excursions Kayakalo guides know the territory and will show visitors the many treasures hidden in the countless channels and immense expanses of the lake. The Société d'aménagement de la baie Lavallière (SABL) is responsible for the largest managed marsh in North America. 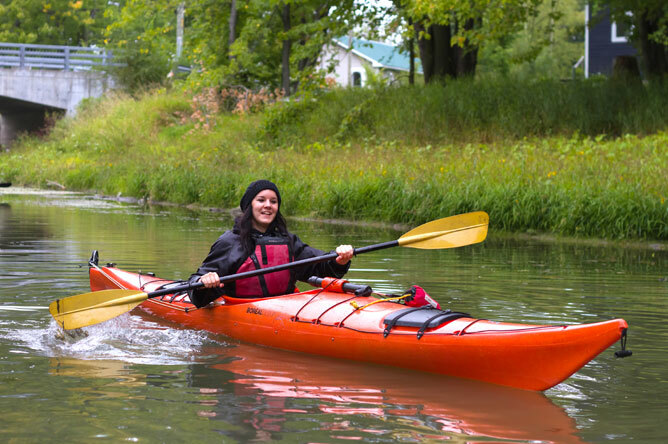 This non-profit organization has set up two boat ramps that allow people to launch a canoe or kayak and explore Baie de Lavallière and the many channels of the archipelago. The Société d'aménagement de la baie Lavallière (SABL) also offers sea kayak rentals. 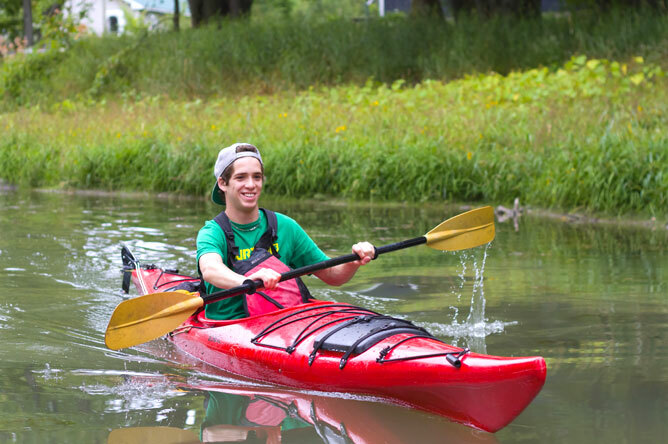 To ensure greater safety, training on the basics of sea kayaking is available on-site. Three young kayakers paddle towards Baie de Lavallière. 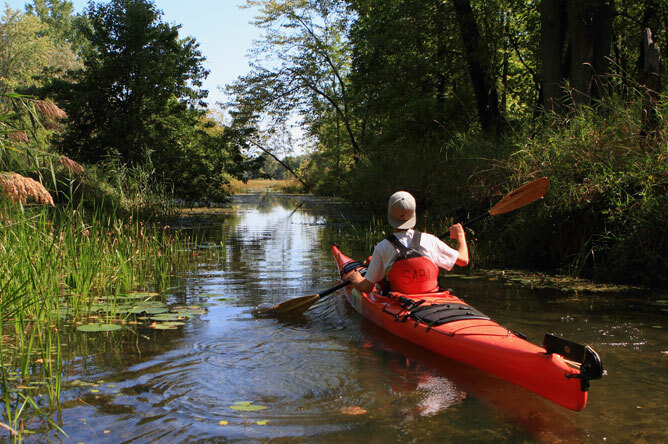 Two types of sea kayak are available: solo and tandem. 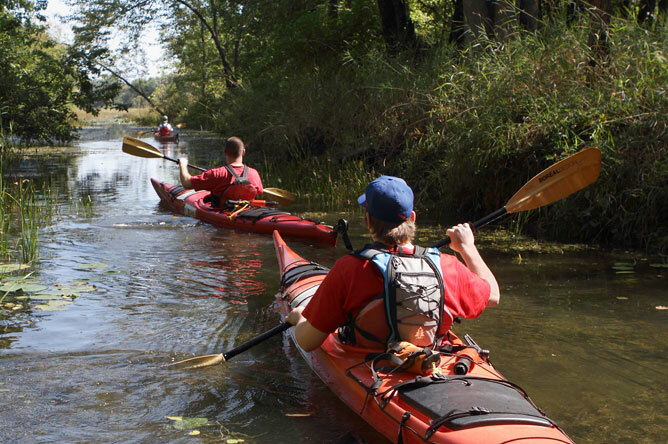 For beginners, tandem kayaks are recommended—especially if you plan to paddle against the current, as this requires more physical strength. 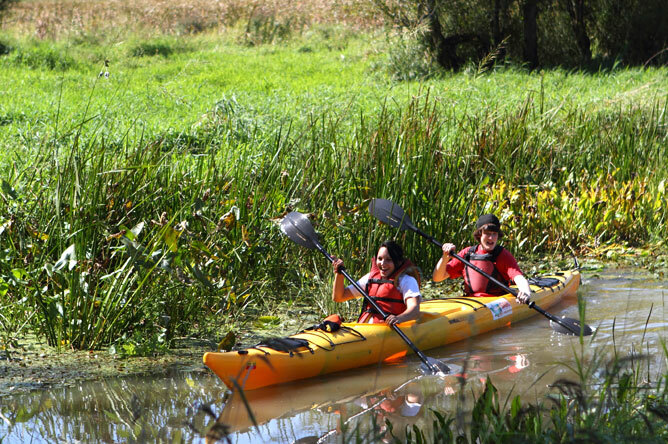 Teachers often bring groups of students for kayak excursions in Baie de Lavallière or to explore the managed footpaths through the wetland. These outings are very popular with students. This direct contact with nature helps young people discover a fascinating new world. 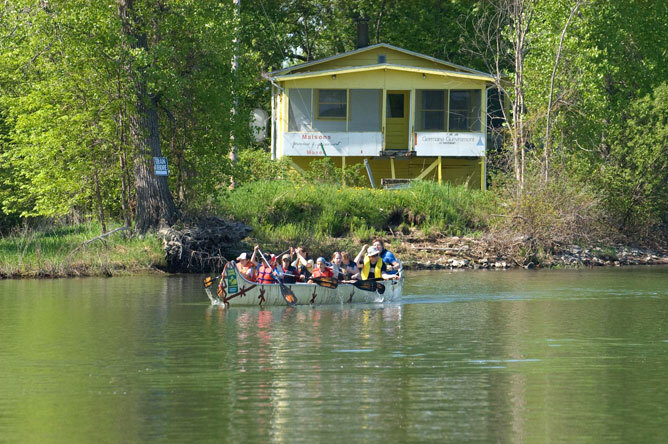 In addition to being a fun excursion and a healthy opportunity to exercise, these trips teach students about the importance of this rich natural environment and its need for protection. This young kayaker paddling along the Chenal de l'Île d'Embarras seems delighted with her excursion in the Lake Saint-Pierre archipelago. Next, she will visit the Maison du marais interpretive centre and walk on the Baie de Lavallière footpath, where she will learn even more about wetland habitats. 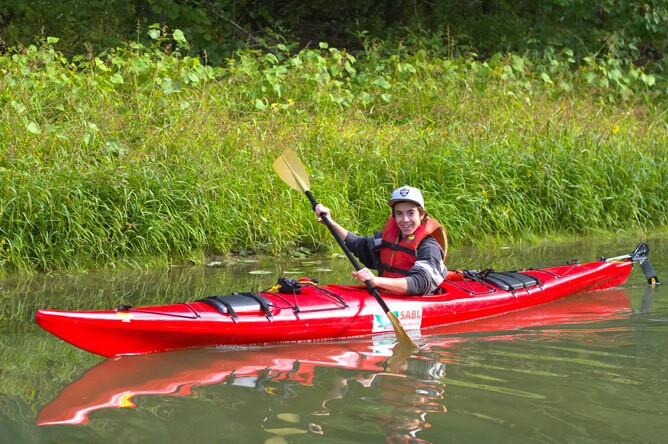 Expéditions de Canots Rabaskas Sorel/Sept-Îles organizes Rabaska canoe wilderness trips to a variety of compelling destinations in the Sorel islands, Mauricie and the Manicouagan region. The trips run from 3 to 14 days long. The company also offers day trips to the Sorel islands. Travellers are always accompanied by a guide. Rabaska canoes are available in a 9-metre version that fits 12 people, and a 12-metre version that fits up to 20. Travelling in a Rabaska canoe will bring you back to the time of the first explorers, and let you see the region in a whole new way! A Rabaska canoe owned by Expéditions de Canots Rabaskas Sorel/Sept-Îles paddles by the cabin that belonged to Germaine Guèvremont, author of the famous novel "The Outlander."